PASO CANOAS, Costa Rica – Jawad Ali (pictured on the left) said he hails from the Swat District of Pakistan, a former redoubt of the Pakistani Taliban, a hard-line Islamist militant group that in 2007 took over the district and continues to support the fight with American troops in next door Afghanistan. The Pakistani Taliban were driven out of the district a few years ago, but the district still labors under the influence of hardline Islamic schools and institutions. I found Jawad on the border of Panama and Costa Rica with a fellow Pakistani traveler from the same region. Jawad spoke some English, so we were able to have a conversation as he waited for Costa Rican immigration to process him through so he could continue his journey on to the U.S. border. As you will see, Jawad intends to claim political asylum as he has heard numerous friends before him have done successfully. Jawad insists he's no terrorist, and that may be true. But American homeland security authorities at the U.S. border won't want to take him strictly at his word, nor should they. Whether Jawad and his friend were with the Pakistani Taliban, against them, or indifferent to them is a question that American law enforcement intelligence officers on the U.S. border will almost certainly want to get answered. 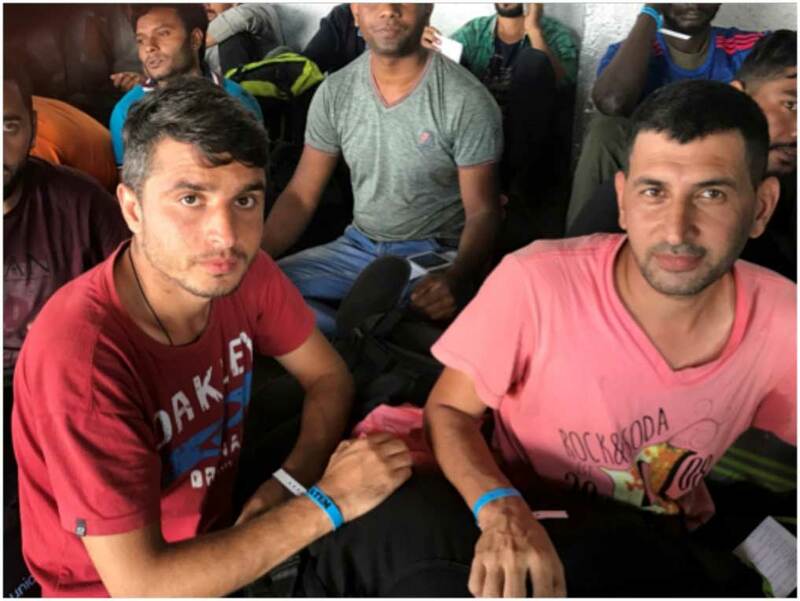 For now, at this stage of their travel, Jawad and his friend will be considered a higher-risk kind of migrant known in U.S. homeland security vernacular as "special interest aliens". Q. How did you get here? Did you pay? A. Yes, yes of course. I found an agent in Pakistan, and he charged me $10,000 ... and he arrange a Brazilian visa for me so then I had a flight from Pakistan to Dubai and from Dubai to Brazil. I stayed in Brazil for half a month. After then, we just came here by bus, walking by our feet ... walking, buses, by our feet. That's it. So that's how we get here. Q. What is the name of your smuggler? A. I don't remember. They never give you their true name. Q. What's the fake name? A. He told me a name, Musa. A. He is from Surab. He told me he is from Surab, but I don't know if that is exact or not because I'm never sure what they tell ... they never tell you. Q. So when you were in Panama, you turned yourself in to the police? A. They didn't tell us anything. We were in the camp, one day, two. We stayed in camps about eight days, and after that we get here. Q. How did you get here? Did the Panamanian police put you on the bus? A. Yeah, yeah. The Panamanian police put us on a bus. $40, everybody paid the $40, and we got here. Q. At the bus station? A. Yes, at the bus, here. We got here near the border. Q. Were the officers on the bus with you? A. No, not on the bus. But the bus is just for 50 people. The bus is made for about 50 people but we were 80, 100 people on the one bus. Two seat, sitting three people. Some of the people were sitting down there on the floor, but yeah we just went here. A. We are going to USA. Q. Do you have an agent [smuggler] helping you now? A. No, no. We are just going by ourselves. Till now, they help us. But not now. Q. Why do you want to go to the United States? A. Because we have some problems over there. This is why we are leaving. We didn't have any other options, this is why I leave my country. Because nobody will give you fairness. Nobody will help your parents. Yes of course there are a lot of problems over there. This is why I leave my country. Q. Which state will you go to? A. I am going to New York. Q. New York? Do you have family there? A. No I do not have any family there. Q. How will you enter the United States. A. Of course we will go to the camp near the border, immigration. Q. What will you say when you get there? A. We are seeking political asylum over there. Q. How did you know to say asylum? A. Because a lot of people have been in asylum over there and they are now safe and secure. They didn't have any problems. This is why I leave my country. Because I have a lot of friends go over there. This is why I leave my country so I am seeking asylum in the USA. Q. Have any Americans interviewed you? A. No, no you are the first one. Q. When you get there, because you are Pakistani, the Americans will be very interested in you. A. Yes, yes of course. A. Sorry, I don't know. Q. You don't why they would be very interested in you? A. Of course I am from Pakistan. Maybe they'll think I'm interested in some type of attack, but we are a peaceful people. We don't have any problem. I know that I ... everything is clear. I am going there without any problem. Q. Where did you get $10,000? A. Some borrowed. From friends, $3,000. I borrowed from some friends. They give us ... one gives me $1,000. Another gives me $2,000. This is how I collect all the money. A. No sir, I don't have a passport. Q. Yeah ... what happened to the passport? A. The agent took it in Colombia. They said you have to give your passport, so I gave the passport. Q. Did the Panamanians take your fingerprints, and eyes? What did they do? A.Yes, of course. Everything. They took our fingerprints, eye scan. Everything. Q. What was your job in Pakistan? A. I was a student there. Q. What were you studying? Q. And why did you leave again? A. I was having some severe problems. Q. What kind of problems? A. Sorry, I can't tell you right here. Sorry. Q. Ok. Some political problem? Or crime, criminal?